Here's my very first attempt at a realistic (non cartoon-y) watercolor! 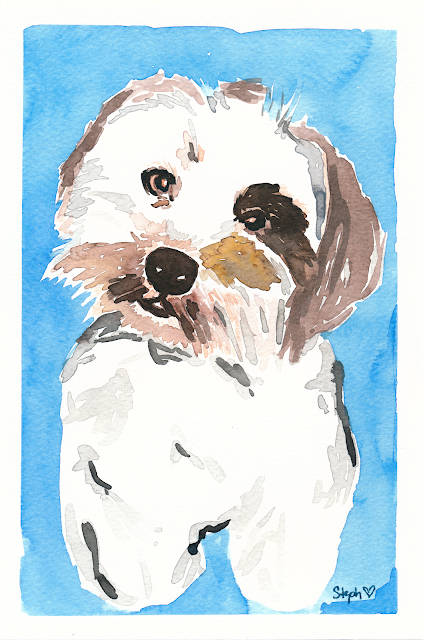 I've always loved custom pet portraits, but never thought I'd be able to create one myself. I'm not sure if it's the #100dayproject keeping my limber and giving me courage, but last weekend I thought I'd give it a try. This sweet dog Cooper belonged to one of my dear friends, and his unexpected passing broke all of our hearts. I wanted to do something to remind her that he was special and will be missed by all. I will probably attempt a few more portraits before gifting her with the final piece, but I wanted to share my process to encourage others to try new things. Here is one of my projects from the #100DayProject I've been participating in on Instagram. The art journal I'm using is the large Dylusions journal (my fav!) with a coating of gesso applied/dried beforehand. The paints used are mostly Golden Acrylics (fluid and heavy body).